Being bullied is one of the worst feelings in the world and it’s even scarier when the bullying turns into physical abuse. 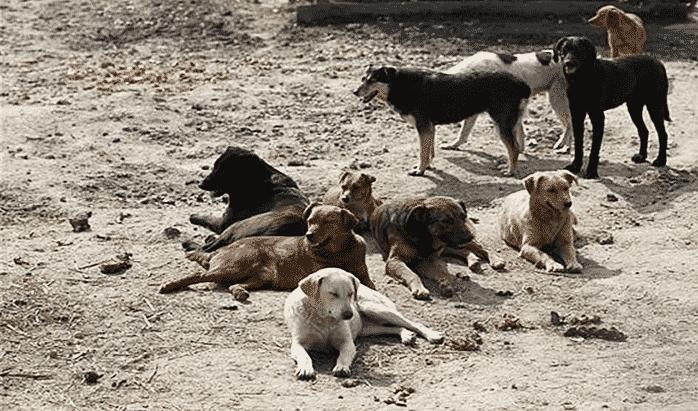 Many of us can relate to this scenario so this tale of a golden retriever that was bullied by wild dogs will definitely strike a chord with you. 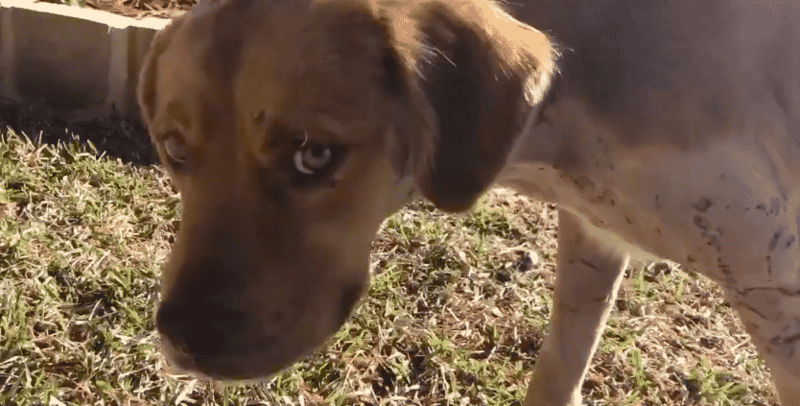 You’ll shed a tear as you read this inspiring story about a bullied pup that eventually found his way home. 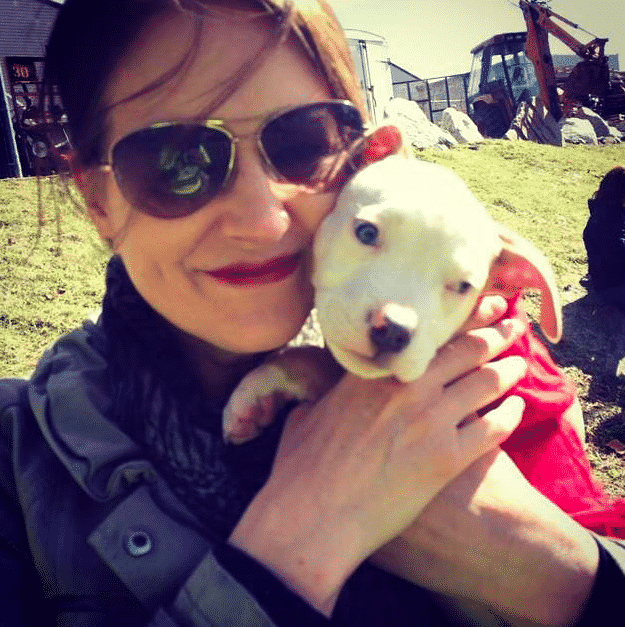 Photo #13 will break your heart! As Goldie was minding his business a wild pack of savage dogs approached him. Unsure of what to do, Goldie was left open to attack. The dogs were brutal to him and he looked for an escape plan immediately. Finally, Goldie found a place where he could avoid the raving pack. Finally, animal rescue arrived and you won’t believe how Goldie reacted. Animal rescue workers were finally called to the scene of the crime. 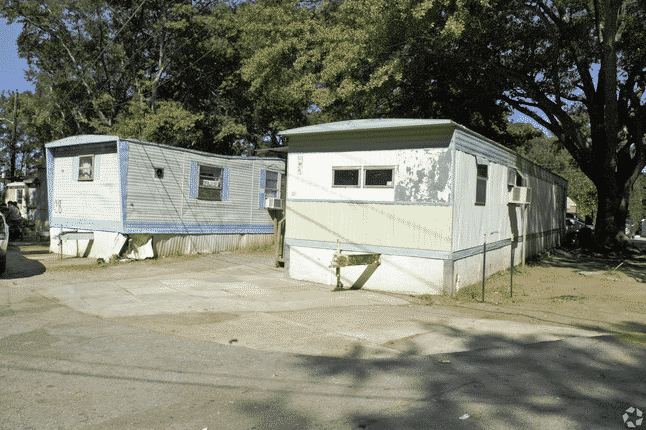 They found the pack of wild dogs barking in the mobile home area and Goldie hiding underneath one of the trailers, scared out of his mind. 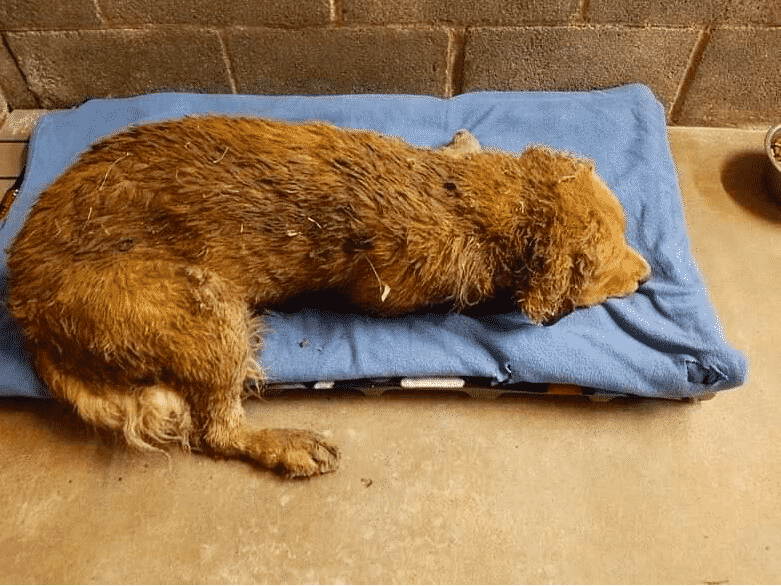 Goldie was so terrified that the animal rescue worker had to physically drag him out from under the trailer because he refused to come out. 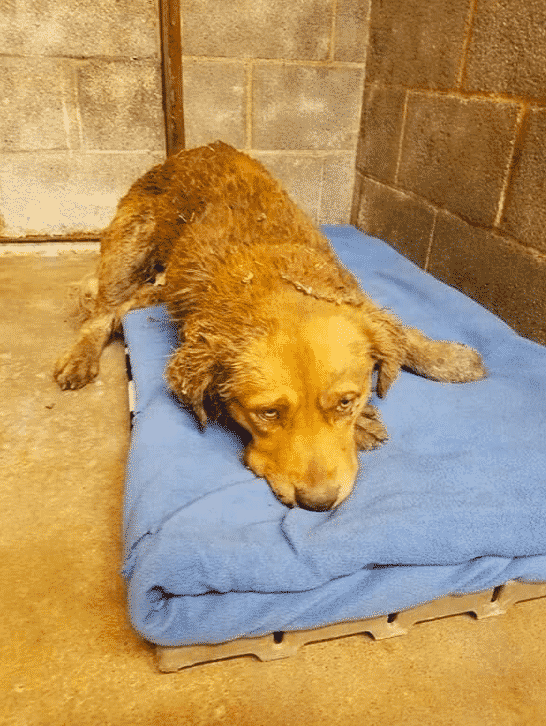 The team at the animal shelter quickly realized that Goldie needed a vet immediately! 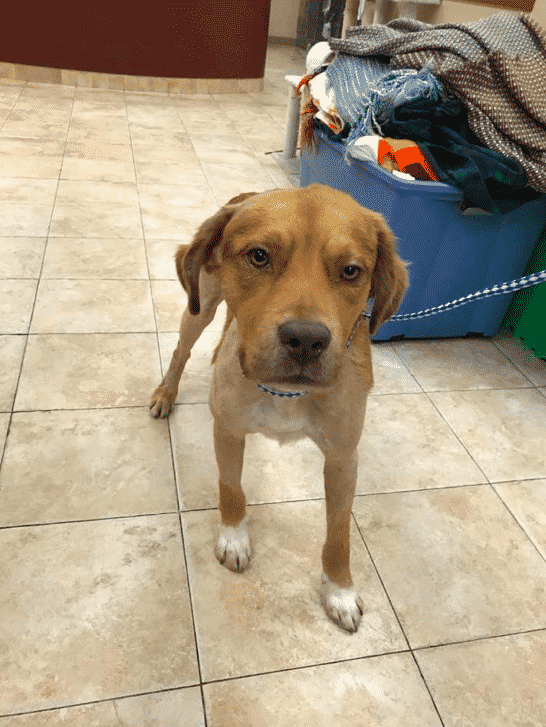 Volunteers from Rescue Dogs NYC saw Goldie and quickly rushed him out of the shelter and into an emergency vet office. 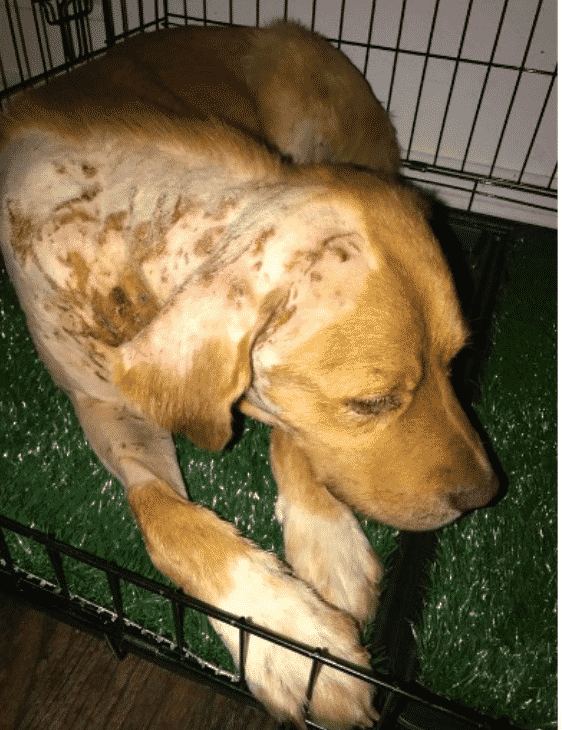 The vets quickly worked on getting Goldie better through the use of antibiotics to fight off any possible infections and stitches for the gashes. But did Goldie take well to the treatment? 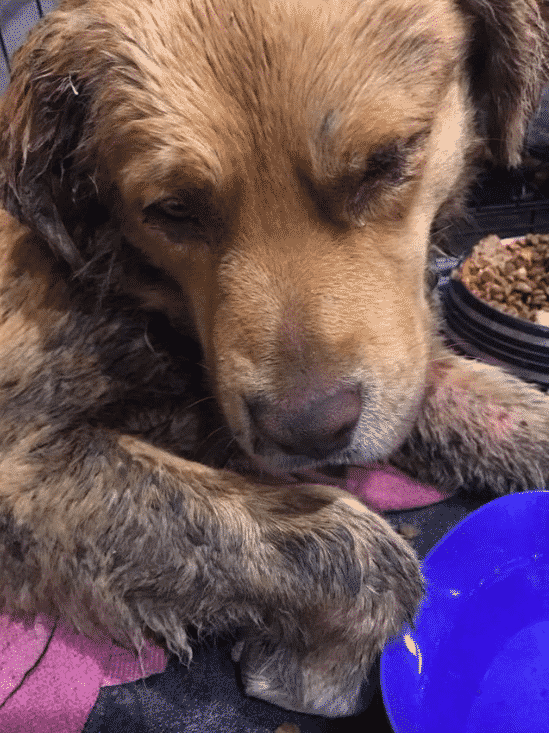 Despite the lifesaving routine from the vets at the emergency animal hospital, Goldie had a lot of healing to do. In fact, he spent two weeks at a vet’s office in Texas before he was transferred off to another vet’s office in Long Island. Everyone continued to outpour love but was that enough to salvage Goldie’s life? 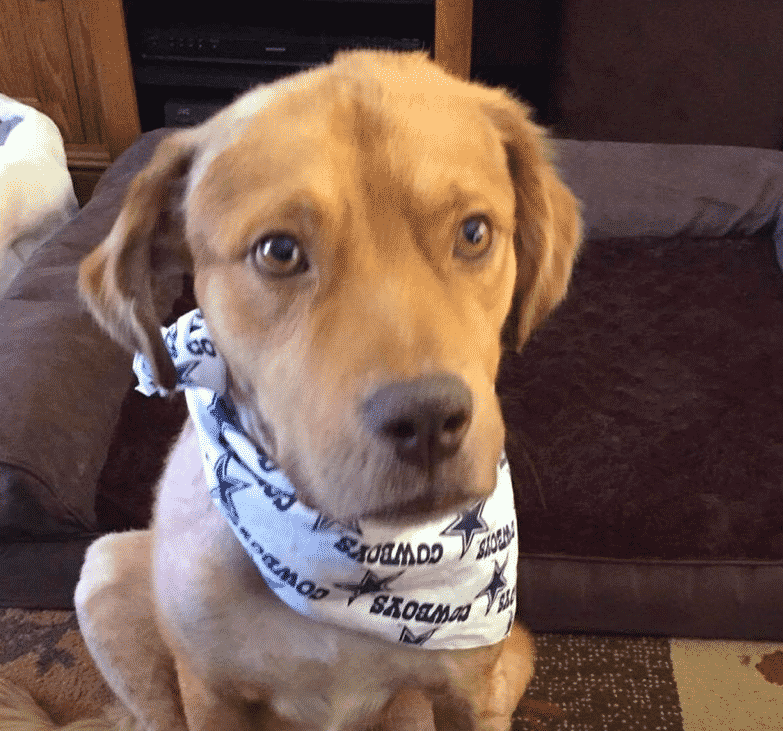 During his stay in Long Island, Goldie spent another two weeks at the vet’s office. Suddenly an unexpected turn of events occurred and the vets were incredibly excited at what was happening with Goldie. You won’t believe how quickly the circumstances changed! After four weeks of recovery time, Goldie finally began to show his true personality once more. He began feeling much better and the vets were incredibly happy to see that the dog was doing better after so much treatment. 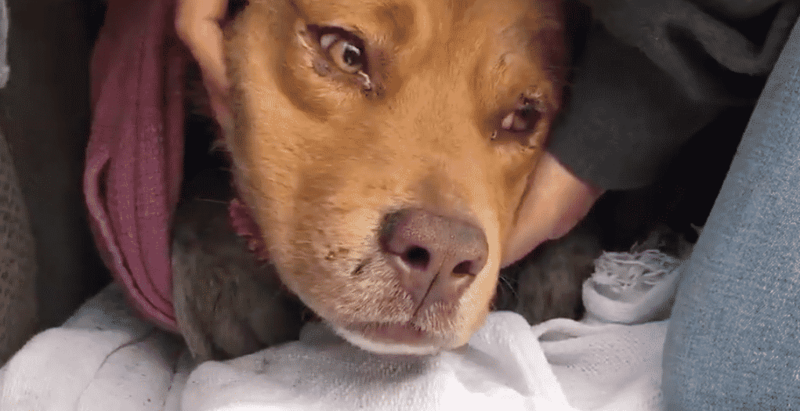 “For days Goldie was so fearful he could not even move, but slowly he realized he was safe and started to regain his confidence,” Rescue Dogs Rock NYC wrote on Facebook. You’ll fall in love with his smiling face in the next photo. 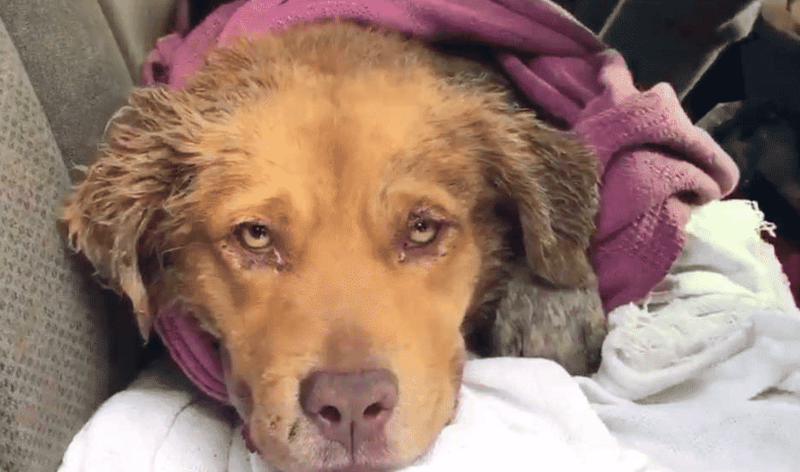 Finally, Goldie was happy and healthy once more and the vets and rescue group were ecstatic. 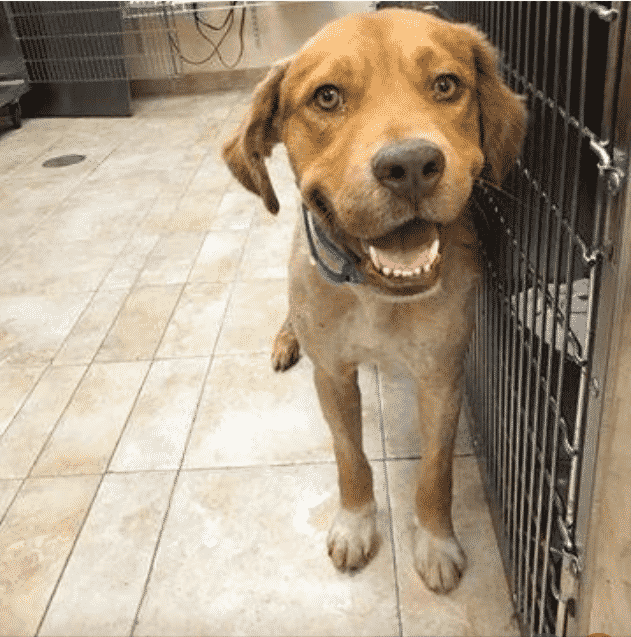 It was time to find Goldie a home that would love and care for him, but it turned out to be a much more difficult process than any of them had originally assumed. Find out why. Goldie was healing nicely and the rescue team was eagerly waiting for him to find his new future home. However, no one came forward to ask about or showed any interest. That was until the group made a Facebook post about him and caught the attention of so many interested parties that it became difficult to shift through them all. So many families were excited to make Goldie part of their family, but only one individual got lucky! Eventually, one of the rescue volunteers from the organization saw Goldie and the post. 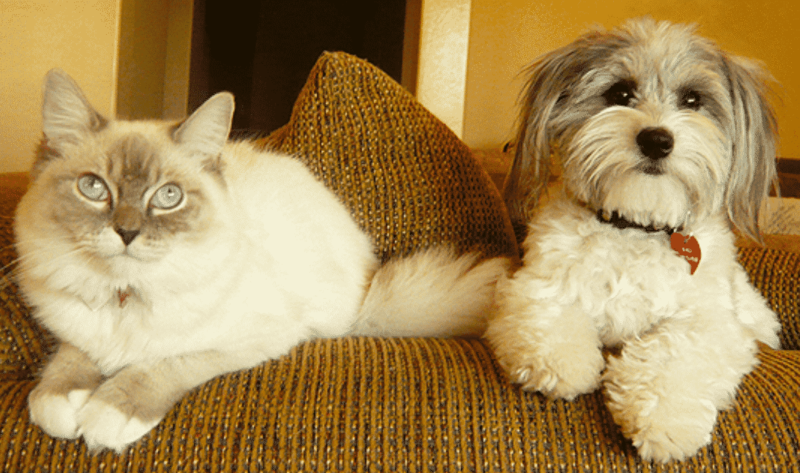 He was immediately interested in adopting the dog as he felt that Goldie would be a perfect match for his girlfriend. So did she end up being the lucky mom of Goldie?! So Goldie finally found a new home with the volunteer’s girlfriend and both of them were incredibly excited. 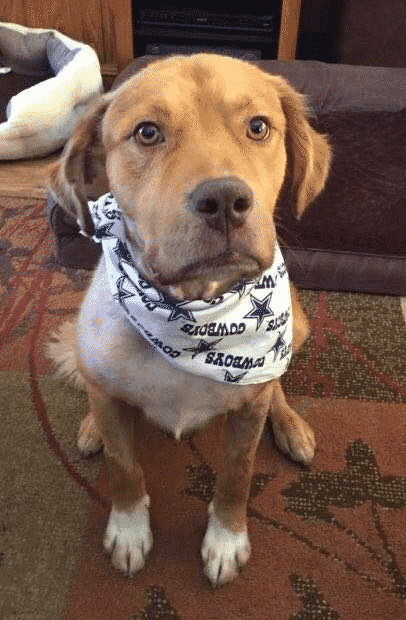 She even renamed Goldie to Dakota or “Dak” for short, in honor of Dallas Cowboy quarterback, Dak Prescott. You would think that after such a terrible experience with other animals Dak would be hesitant to bond with his new mother’s pets, but that couldn’t be further from the truth! Dak’s new mother was nervous about how he would interact with his new animal siblings especially after such a traumatic attack. However, Dak surprised everyone by immediately getting along with his new four-legged pals. The family is finally complete and happy all together. 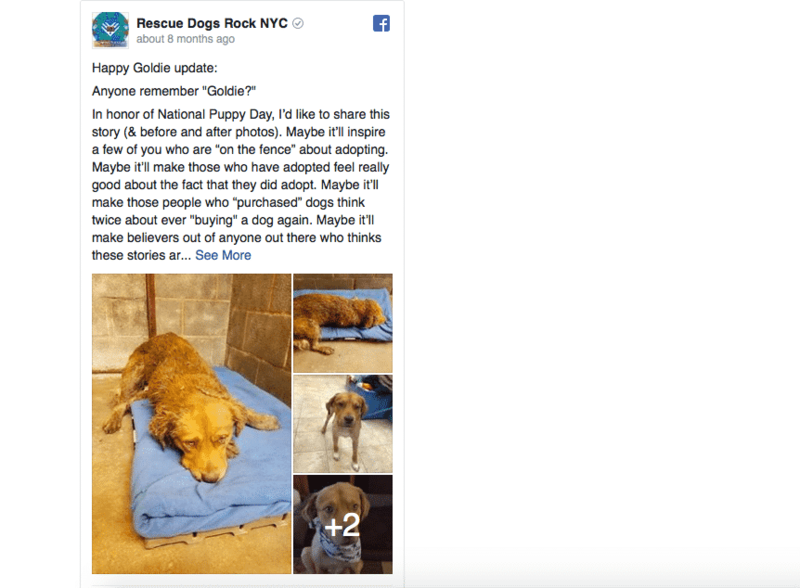 The cofounder of Rescue Dogs Rock NYC had some very encouraging words to say and they’ll leave you feeling happy about the entire situation in case you were still worried about Dak a.k.a. Goldie! “Now he’s doing amazingly,” Silverstein said. “He’s in an amazing home. He loves everyone, every dog, cat. 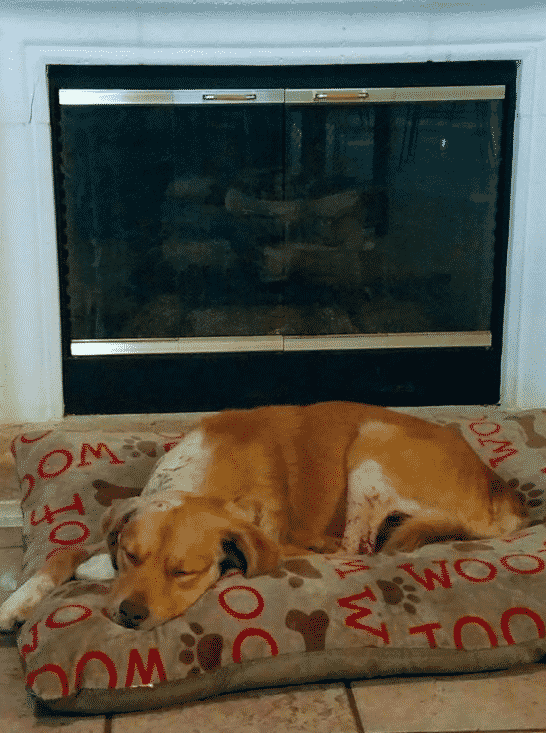 He’s completely healed, and he’s a complete miracle.” Who else is absolutely delighted to hear that the situation turned out perfectly for Goldie after all of that pain and trauma?! This story is a great inspiration to everyone. 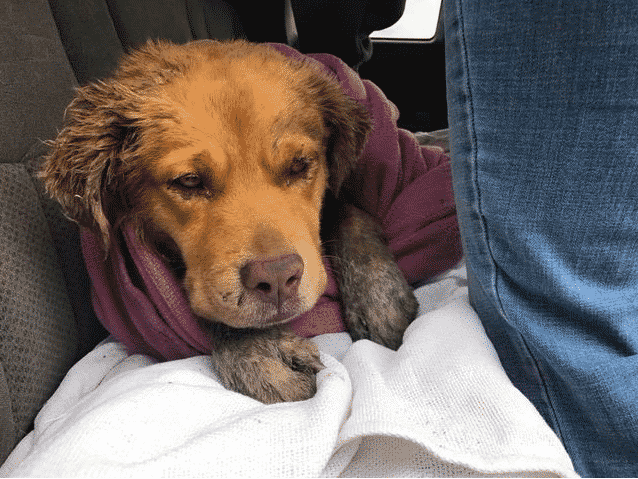 Goldie’s courage to open up to love and heal through his terrible experience should make us all feel strong enough to deal with any problems that life may throw at us. We hope you leave off feeling inspired to face your difficult life situations while keeping the adorable Goldie in mind.